Wow! Two books about 19th century Scotland in two days! And to make it even better, it’s also two strong, female Scottish women in two days as well. After reading these two books I know more about the situation of women in 19th century Scotland than I ever thought I would. These two women live very different lives, but their fight for women at that time makes them one in cause. Once again, I’m thankful for women like Iza and Jess that paved the way for the rights women have today. What was Iza’s story? Find out in my book review of The Caseroom by Kate Hunter. “Set in the thick of workers’ lives in Edinburgh’s thriving print industry, The Caseroom follows Iza into the arcane world of the caseroom where she learns the intricacies of a highly-skilled trade. In all honesty, before I read this book I had never heard of a caseroom. I had no idea what it was or what it was used for. Oops! You’d think someone who loves to read and proofread would know some of the history of printing. But, no. Everything about the caseroom was new to me. I didn’t know what any of the tools were or what they were used for. The names of the different jobs there were also brand new to me. Needless to say, I learned a lot from this book. 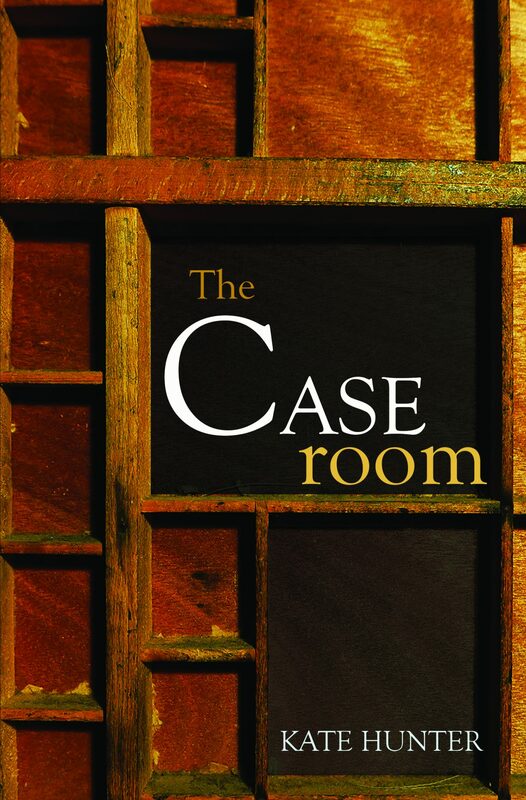 I liked the writing style of the The Caseroom, and I thought it was well written. Most of the characters were well developed and seemed realistic. I couldn’t decide how I felt about Iza. Sometimes I liked her a lot, and sometimes she bothered me. That sometimes happens in real life, though, I suppose. I did admire her for her bravery in standing up for women’s rights. Just working in the caseroom was enough to make some of the men angry, including her brother. She persevered, though. Even without her brother’s blessing she went to work. I loved her determined attitude. Iza’s family seemed, for the most part, like a good family. They had their problems, but seemed to usually work them out. Each of the family members brought a unique angle to the story. I also liked her co-workers Netta and Margaret. Roddy Mac was a character that I never trusted or liked, for some reason. I liked that this story was based on “the author’s father’s family history.” The story happens to be “based on real events and features some actual historical characters.” I think that it’d be fun to write a story about my ancestor’s lives. The one thing that was hard for me with this book was the language. The author uses terms for things that I’m assuming were appropriate for the time period. I guess it’s a good thing, but consequently, I didn’t understand a lot of the book. Even my Kindle couldn’t define the words, so that’s not a good sign. I think it would be a great story for people who know the language a little better than I do. I don’t think I’ve ever read a book that takes place in 19th century Scotland. I can’t even imagine what it would be like to be a woman during that time. It would be so confining to not have control of your life. Why anyone would think that a woman should not be able to choose her own path is beyond me. Reading this book made me especially grateful to live where I live in this day and age. It also made me thankful for all the women that went before me that have gotten us to this point. 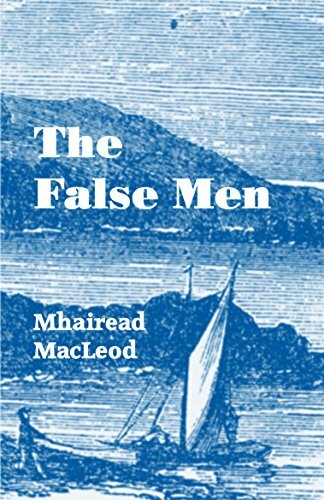 I hope you enjoy my book review of The False Men by Mhairead MacLeod. Jess MacKay has led a privileged life as the daughter of a local landowner, sheltered from the harsher aspects of life. Courted by the eligible Patrick Cooper, the Laird’s new commissioner, Jess’s future is mapped out, until Lachlan Macdonald arrives on North Uist, amid rumours of forced evictions on islands just to the south. I haven’t ever been to Scotland, but I’d like to go! It sounds like such a beautiful place. The author did a good job describing the setting. I could totally picture the layout of the land with the homes and farms. The descriptions made me want to go there; so I think they did their job! I liked the writing style of this book. It was a little hard to figure out what was going on in some places because I’m not familiar with the language, but the more I read the easier it became. The writing is engaging and full of heart. Jess’ heart. She should have been born in the 21st century because she was a bit much for everyone else in the 19th century to handle. Jess believed that she could make a difference, and women didn’t really get that opportunity at that time. She thought she should be able to make her own decisions about her future, and that wasn’t really a thing either. What Jess decided to do surprised me, and it took the book in a whole different direction than I thought it would. Jess is a great character. She is strong, opinionated, a bit crazy, and full of heart. Her character is well developed and realistic. It’s too bad she just didn’t fit in her time period. I’m sure it was women like her that got the ball rolling, though. I thought that all of the characters were well developed. Patrick, Catherine, and Lachlan were especially well developed, along with Jess’ father. Overall, I liked this book. I loved traveling to Scotland via The False Men Express. Maybe someday I’ll be able to actually travel there, but for now, I’m good reading about it. If I could go back in time and live for a week anywhere I wanted, I’d choose Victorian England. Of course, I’d be picky and choose to be a wealthy person. I’d love to walk the sprawling gardens of the grand estates. It’d be amazing to dance at the balls and wear the beautiful gowns. Just for a week, I’d love to write with a quill pen and ride in carriages. What do you think? Where would you go? I love the Jane Austen era, and am so excited about this book! 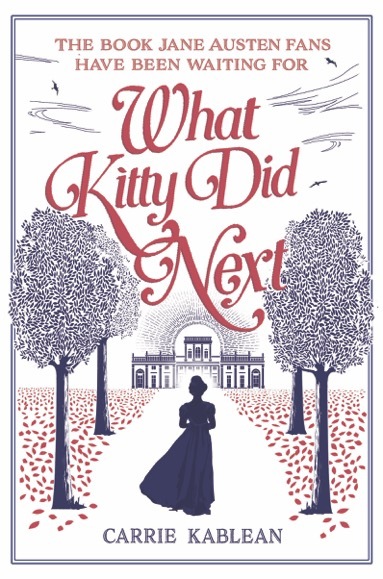 I hope you enjoy my book review of What Kitty Did Next by Carrie Kablean. When her world unexpectedly expands to London and the Darcy’s magnificent country estate in Derbyshire, she is overjoyed. Keen to impress this new society, and to change her family’s prejudice, Kitty does everything she can to improve her mind and manners – and for the first time feels liked and respected. However, one fateful night at Pemberley, a series of events and misunderstandings conspire to ruin Kitty’s reputation. Accused of theft – a crime worse almost worse than murder among the Georgian aristocracy – she is sent back home in disgrace. But Kitty has learnt from her new experiences and what she does next will not only surprise herself, but everyone else too. Oh, how I love Jane Austen! I know several friends who cannot stand her writing (you know who you are…), but I love it. I love the crafted language. I love the detail in the characters and their descriptions. It may bore some people, but I love that the stories are NOT action-packed. The people are the main focus, and I love how the stories play around the people and their experiences and thoughts. What does that have to do with today’s book review? Well friends, I think we may have found a book that is as close to a Jane Austen as we’re going to get in today’s world! Today’s books are marked by action. My own kids have been sucked in, much to my chagrin! If it’s not one action scene followed by another, it’s boring. Well, they’ll be bored if they read this book, but I loved it! The language was very well crafted. I read it on my Kindle and it turned out to be a good thing because of all the definitions I had to look up. My kids asked if I felt stupid needing to look up so many words and I definitely said, “No!” I loved it! They think I’m weird, for sure. I may not be the “cool” or “hip” mom anymore, but that’s ok with me. I’m smarter because of it. The time Ms. Kablean took to develop the characters showed off. Each of them were well developed, realistic, and unique. Each had his or her own personality that was different from everyone else’s. They had their own voices. And they each had their own journey to take in the story. I loved watching them grow and come into themselves as the story went along. I’ve read all of Jane Austen’s books, and have loved them. This book comes as close as I think I’ll get to more Jane Austen stories. They may be Carrie Kablean stories, not Jane Austen stories, but the feeling is the same. The crafted language is very similar, and the attention to detail is mighty close. The only thing I didn’t love was the title. It was not my favorite; I think it could have been better. Other than that, I loved this book. I just got caught up in the feeling of the story, the language of the story, and the characters’ lives. If you like Jane Austen books, and even if you don’t, you’ll enjoy this book. It’s not fast-paced or action-packed. It’s not about the superhero that swoops in to save the day, or the super powers, it’s about life and the people in it. It is about truth, friendship, trust, love, care, concern, honesty, values, and family. It’s about falling in love and having your heart broken, and it’s about picking yourself up, learning from it, and moving forward. Life. I loved it. Disclosure: I received a free copy of this book in exchange for my honest review. This book review is dedicated to my good friend Andy who passed away this week after a six year battle with brain cancer. He leaves my dear friend Betsie and their three beautiful daughters behind. He was an amazing guy and will be greatly missed. Love ya Andy! I have always loved studying about the American Revolution. It’s one of my favorite topics to learn about. I have read 1776 by David McCullough several times, along with Revolutionary Summer by Joseph Ellis and a few others. Usually I read the nonfiction history books. This time I thought it might be interesting to read a historical fiction book about it. What did I think? Was it a good choice? 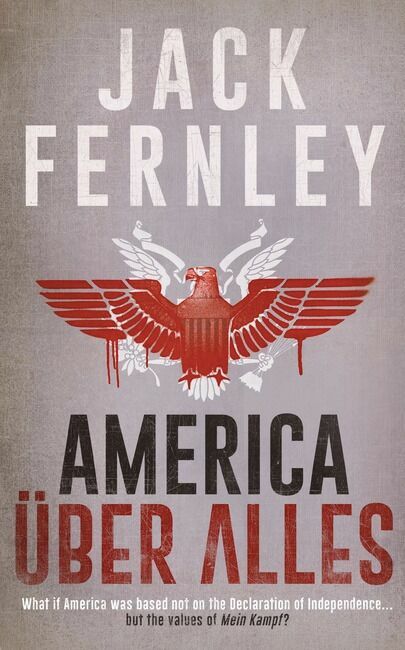 Find out in my book review of America Uber Alles by Jack Fernley. “What if America was based not on the Declaration of Independence, but the values of Mein Kampf? Germany, April 1945. As the Russians close in on Berlin, a lone plane flies into the city. On board are General Robert Ritter von Greim and the Nazi flying ace, Hanna Reitsch, summoned by Hitler to his bunker. There, the Führer reveals Germany’s secret weapon – a weapon he believes will win the war for the Nazis and change the course of history for ever. America, December 1776. George Washington and his army are close to collapse, the War of Independence is almost lost. The British army scent victory, aided by the arrival of extraordinary German mercenaries. However, when the Germans offer the Americans secret intelligence to allow a surprise attack on their supposed allies, it becomes clear that all is not as it seems. Who are these Germans and what are they fighting for? When you know and love a topic really well, it’s difficult to keep an open mind. It’s hard to accept new ideas about it, even if they’re fiction. Even though you’ve never met the actual players, you feel like you know them. You know their thoughts, behaviors, and values, and nothing can change your opinion of them. That’s how I feel reading this book. I’ve studied a lot about the American Revolution and its key players. Accepting many of the points in this book is pretty much impossible for me. I tried though. The first half of the book dealt mainly with battles and war tactics. The author did spend time building the characters. Many of the important characters are introduced, and some of them you get to know really well. I felt like many of the characters were well developed and realistic. He also tried to show the relationships between many of the characters. The author also spent a lot of time building up to why the people would accept a new way of thinking. Although I hope I would see it for what it was, I could see how people would embrace the thought of it. I don’t think they’d fully embrace it if they knew the actualities of it, but it’s happened before. It had to be a very subtle change over time. The second half of the book had a definite change in tone. This half of the book focused more on the people in the Revolution. For much of the second half I hated the book. I seriously could not wrap my head around anyone going along with any of it. I found it scary how fast people changed their whole belief systems. With everything I’ve read about the Founding Fathers, I could not see how any of them would accept this. The soldiers are a different story. They were suffering hardships, and they were a ragtag band of soldiers. Unfortunately, I could see why they would like the idea of being fed, having shoes, uniforms, and a nice place to sleep. However, I also didn’t see why they would fight for Nazi values after all they’d been through. Trading one form of tyranny for another isn’t a great option. Towards the end of the book I started not hating the book and just disliking it a lot. I truly could not see any of the Continental Congress or Founding Fathers just standing by or accepting the Nazi values. Once again, I didn’t personally know any of them. However, my brain can’t comprehend them allowing someone else to plow over their ideals. The American Revolution, along with its values, cause, and purpose is too ingrained in me to accept anything less. Just when I thought it all might be ok, the book ended. Yep, just up and ended. Nope, I wasn’t a fan of the ending. It could have used another twenty pages or so to finish things off. It left off with a lot of holes. There were many things that I thought should have been explained, but I was left hanging. That disappointed me, for sure. Overall, it was ok for me. Maybe a non-American would have an easier time accepting it as a possibility. I guess I did find it interesting to think about how perfectly everything came together in reality. It could have just as easily gone the other way. What would life be like now if it had? People ask me all the time what my all-time favorite book is. Well, here it is! I have LOVED Les Misérables for many, many years. I saw the Broadway play when I was younger, and it hooked me. I’ve read this book at least three times. The unabridged version, of course (1,463 pages)! I love, love, love it. 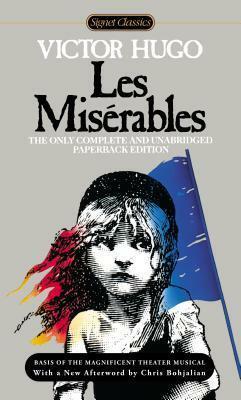 Please enjoy my book review of Les Misérables by Victor Hugo. Did I mention that it’s my FAVORITE book?? “Introducing one of the most famous characters in literature, Jean Valjean—the noble peasant imprisoned for stealing a loaf of bread—Les Misérables (1862) ranks among the greatest novels of all time. In it Victor Hugo takes readers deep into the Parisian underworld, immerses them in a battle between good and evil, and carries them onto the barricades during the uprising of 1832 with a breathtaking realism that is unsurpassed in modern prose. Wow! Where to start? This book is amazing. Simply amazing. It is my all-time favorite book! I LOVE this book! The character development is unsurpassed. Each character comes to life on the page. Hugo’s attention to the details about the characters allows them to become a part of your life. They become beloved friends, hated enemies, and family. These characters don’t disappear with the closing of the book, either. They stay on your mind for days and years after. You wonder about them, long to see them again. There’s a lot of history in this book. To some people it may be too much, but I love every word of it. I thoroughly enjoy learning about the French Revolution and its key players. Hugo somehow manages to make it exciting. Now, if you’re not really a fan of long history lessons, you may enjoy the (gasp!) abridged version instead. I, however, love the history and the descriptions of the time period. I love the intricacy and craft of Hugo’s writing. No one writes like that anymore, and I wish they did. Les Misérables is filled with emotion. As you read you’ll feel the whole range of emotions. You’ll laugh, you’ll cry, you’ll get angry, and you’ll begin to see your own life differently. You’ll look at how you treat people, and how others are treated. You will feel gratitude for your blessings and circumstances. Yes, there are still unkind people and there are still unjust circumstances, but overall, living conditions have drastically improved since then. If you want a new friend, one that will be with you for awhile, then this book is for you. You’ll have this friend with you for the rest of your life. It takes a long time to read this book, but while you read it becomes a part of you. I cry the last 200 pages. Seriously. I don’t ever want it to end. Please read this book then call me so we can talk about it! I love this book so much and I highly recommend it! This review was first published on 09/24/09; updated on 6/18/18. I love learning about the American Revolution. It’s my favorite history subject to learn about. The American Civil War comes second on my list. 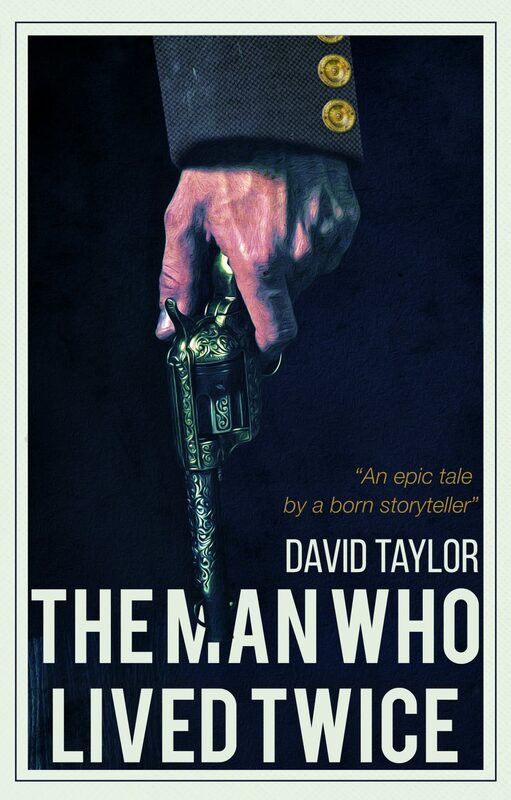 So when the chance came to write a book review for The Man Who Lived Twice by David Taylor, I got excited. I haven’t read any books where the main character fights for the Confederacy, so I got really excited. With such a compelling teaser, I had to jump on the opportunity. “A hero to General Robert E. Lee and a legend to the gullible hillbillies under his command in the American Civil War, ‘Ole St Lege’ charged with the Light Brigade in the Crimea, defended the bullet strewn barricades in the Indian Mutiny and hacked his way through the Second Opium War. Yet the Cornish mercenary that fought so valiantly for the Confederate cause was a wanted criminal, a fraudster who bankrupted his own father. As I stated above, I love learning about the American Civil War. I haven’t ever read a book written from the Confederacy point of view, so I was excited to read it. George St Leger Grenfell is a person I’ve never heard of. Apparently he didn’t start out as the greatest man. He made a lot of poor choices and came to regret some of them. The book starts out talking about Major General Robert Ross commanding his British troops in August of 1814. His troops pretty much walk into Washington and burn the Capital building with books from the Library of Congress (gasp!). The troops waded through James Madison’s personal items to take souvenirs. One of them found some papers written by James Madison; they stated the reasons the Americans declared war on the British in 1812. From there it skips to 1862, where George Grenfell is fighting for the Confederacy in the American Civil War. I hate to admit how confused I was reading this part. There are a lot of characters and I could not remember who was who. I’m not familiar with very many military terms, so I got a bit lost. I did catch that Grenfell was the main character and that he was English. I also gathered that he had a past that he seemed to be running from. The character development for Grenfell was pretty good. It takes about half of the book before you see the whole picture, but in the end I thought Grenfell was well developed. I liked the part about Rose Greenhow and her daughter Rosie. Both of them were also well developed. The very intimate letters written between George and Rose were quite racy. Wow! (I’m still blushing…) What I really liked about Rose was that she was a spy! Seriously? I had no idea that women were spies back in the 19th century. Now I need to do a little research and find out if there are books about other women spies. Overall, I liked the book. I did find it quite confusing at times, but it’s probably my lack of understanding military terms. There are a lot of characters to keep track of, and that became a bit tricky too sometimes. In the end, I thought it was quite an adventure, and I liked that he tried to make things right. I always enjoy learning about new people, and I’m glad to have learned at least a little about George St Leger Grenfell. Although this story is sad, it is so inspiring. I can’t imagine living under the same circumstances that these people did. They were so strong, and brave in their own ways. I like to hope that I would have had the courage to do what they did. I first reviewed this book in December of 2016. It has been discussed quite a bit on social media lately, so I updated my review. 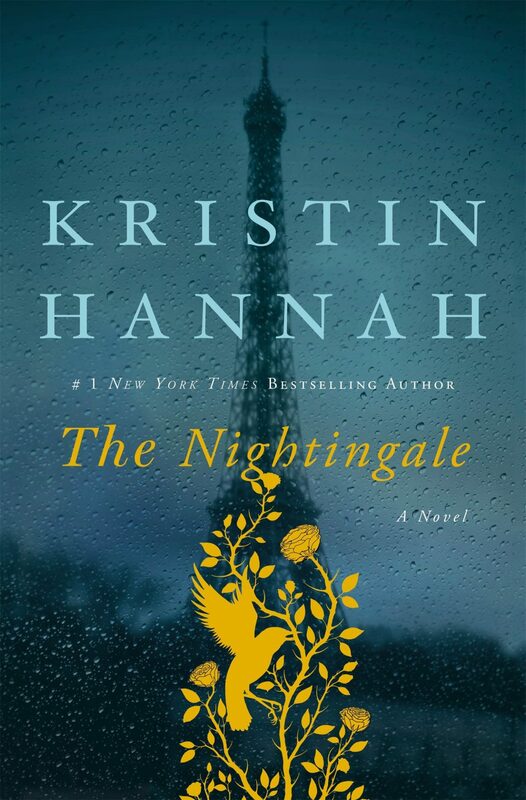 I hope you enjoy this updated book review of The Nightingale by Kristin Hannah. “In the quiet village of Carriveau, Vianne Mauriac says good-bye to her husband, Antoine, as he heads for the Front. She doesn’t believe that the Nazis will invade France…but invade they do, in droves of marching soldiers, in caravans of trucks and tanks, in planes that fill the skies and drop bombs upon the innocent. When a German captain requistions Vianne’s home, she and her daughter must live with the enemy or lose everything. Without food or money or hope, as danger escalates all around them, she is forced to make one impossible choice after another to keep her family alive. Vianne’s sister, Isabelle, is a rebellious eighteen-year-old, searching for purpose with all the reckless passion of youth. While thousands of Parisians march into the unknown terrors of war, she meets Gaetan, a partisan who believes the French can fight the Nazis from within France, and she falls in love as only the young can…completely. But when he betrays her, Isabelle joins the Resistance and never looks back, risking her life time and again to save others. I loved this book! You should know by now that I enjoy reading WWII books, and have read many of them. This one is definitely close to the top of that list! This book is very well written. It flows well, it transitions easily, and you find that the characters are among your best friends. The characters are very well developed and realistic; so much so that you find yourself laughing when they do (although there’s not a whole lot of that in this book), crying when they do, and fearing for your life as they do. The story can be a little slow in a few places, but overall it moves at the perfect pace and draws you into life in Carriveau. I definitely relate more to Vianne in this story. I’m a rule follower and tend to not take scary chances on things that may get me in trouble or put someone I love in danger. I wish I had more of Isabelle in me. For sure. Vianne may surprise you though! The story of Rachel and what happens to her and her family just breaks your heart, and the story of Von Richter will make your blood boil. Then a character such as Beck will come along, and make you feel a little better about the world. My book group and I looked it up, and there was a route that people took, just like the one that the Nightingale took, which is interesting to note. I had heard a lot of good things about this book before I read it, and let me say it did not disappoint!! I highly recommend it. There is language in this book, including at least one “f” word. There’s also some “intimacy,” including scenes and innuendos. There is quite a bit of violence in this book. It is a war, so there is fighting and bombings, there are deaths of some of the characters, and a few of them are quite graphic and difficult to read. This review was first published on 12/5/16; updated on 4/30/18. I love that this book takes place in Victorian England! It reminds me more of a Jane Austen or Bronté sister novel than the other proper romances have. The research that went into this book shows through, and I like that it’s historical fiction as well. I hope you enjoy my book review of Ashes on the Moor by Sarah M. Eden. “The life of an impoverished schoolteacher is not one Evangeline Blake would have chosen for herself. Torn from her home and her beloved sister and sent to work in the gritty factory town of Smeatley, Evangeline must prove herself to her grandfather, a man who values self-reliance above all else, before he will grant her access to her inheritance. Raised to be a lady of refinement, she hasn’t any of the skills necessary to manage on her own nor does she have the first idea how to be a teacher. But failure means never being with her sister again. Alone and overwhelmed, she turns to the one person in town who seems to know how she feels—Dermot McCormick, and Irish brick mason who is as far from home and as out of place as she is. Despite the difference in their classes and backgrounds, Evangeline and Dermot’s tentative friendship deepens and grows. Her determination and compassion slowly earn her the faith and confidence of the skeptical residents of Smeatley, who become like the family she has lost. If I could choose somewhere to travel back in time to, it would be Victorian England. I would love to see the homes with their beautiful gardens and the landscape with the moors. The dresses the women wore would also be at the top of my list. Of course, I’m sure in everyday reality it wasn’t as romantic as a Jane Austen or Emily Bronté book. However, I would love to stay a week and try it out. 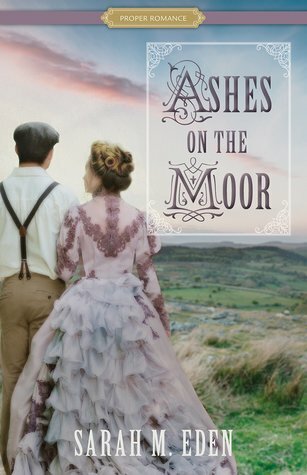 Taking this into account, you may imagine my happiness when finding out that Ashes on the Moor by Sarah M. Eden takes place in Victorian England. As soon as I saw the beautiful cover I couldn’t wait to read this book. Evangeline is not the easiest person to like at the beginning of the book. Neither is Dermot, actually. Or Aunt Barton. The beginning of the book is a bit depressing, and there are a bunch of grumpy characters. Evangeline’s mood is understandable, though. She finds herself dropped into some very difficult circumstances. I did enjoy seeing her transformation over the course of the book. Dermot also comes across as grumpy and rash. At least he usually acts as a gentleman. I thought Ms. Eden did a great job with his Irish accent and personality. Ronan is my favorite character. What a sweetheart! I also loved the school children. Now, I may be biased because my passion (besides blogging, of course) is teaching kids to read. I loved all of that in the book. Evangeline may have used some unconventional methods, but doing what is best for the children is always the right move. The children’s accents and dialect were written so well; you can tell that Ms. Eden did her homework. I have read all of Sarah M. Eden’s books, and Ashes on the Moor is my favorite! The moment when the title came into play was such a tender scene, and I loved how it fit. The story is predictable and there is lots of cheese, but isn’t that what makes a proper romance so good? I thought that it was well written, well researched, and well….a fun, entertaining read. Will it change the world? Nope, but it is perfect for a snowy afternoon or a warm beach. I’m loving the historical fiction proper romance thing going on here! How fun to learn about a real literary historical figure and his love story. It’s fiction, of course, but Ms. Kilpack did her best to base the story off of real events and people. I liked this book a lot, and I hope you enjoy my book review of The Lady of the Lakes by Josi S. Kilpack. “Walter Scott has three passions: Scotland, poetry, and Mina Stuart. Though she is young and they are from different stations in society, Walter is certain their love is meant to be. For years, he has courted her through love letters. She is the sunshine of his soul. Though Mina shares Walter’s love of literature and romantic temperament, it’s hard for her to know if she truly loves him or if she has only been dazzled by his flattery. When she meets the handsome and charming William Forbes, her heart is challenged. Who will she choose? But as every poet knows, “the course of true love never did run smooth,” and on a windy morning in the lake country, Walter meets Charlotte. At twenty-six, Charlotte Carpenter believes she will never find love. After all, she is a Catholic-born Frenchwoman living in London with a family history shadowed by scandal. Though quiet, practical, and determined to live a life of independence, her heart longs for someone to love her and a place to call home. 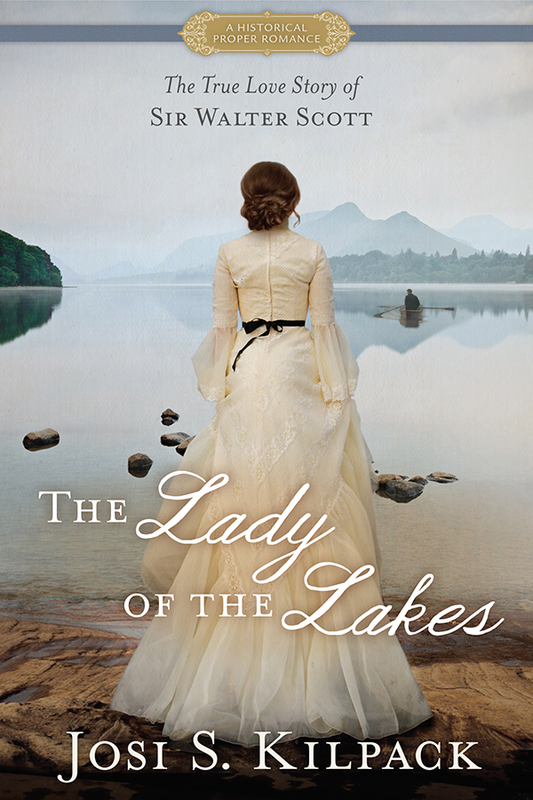 I have always enjoyed a sweet love story, and The Lady of the Lakes is no exception. This story has all the elements that make a good love story: poetry, romance, dedication, heartbreak, suffering, and true love. I love that Sir Walter Scott’s poetry is written throughout the book. As a reader you can just picture him writing his poetry for the love of his life, and also to combat his heartbreak. The characters come to life on the page. Josi S. Kilpack did a great job of developing them well and making them realistic. I especially liked Sir Walter Scott’s voice and Charlotte’s voice. Charlotte was one of my favorite characters. Her need for independence and her strong voice make for a great character. It was fun to see her grow and progress throughout the book. There were times when Walter’s character was a little irritating; I just wanted to scream, “Get over it already!! !” Thankfully, his brother and friend were there to help him! The story flows well, and the transitions from person to person are easy to follow. Josi S. Kilpack does a great job of describing the scene without overdoing it. While reading, I felt like I had been transported back to the late 1700s. Each character sounds and feels different as you’re reading, so you don’t need to keep checking the beginning of the chapter to figure out which character you’re reading about. Reading this book definitely makes me want to go to Scotland and see where it all took place! It’s too bad we can’t all take a Readathon fieldtrip to Scotland; that would be so much fun! I thought this was a sweet love story and I enjoyed it. There is no profanity or violence in this book. There isn’t any “intimacy” either, except for some brief kissing and a few romantic moments. I love that it’s clean and you don’t need to worry about what the next page may hold! That’s definitely a benefit to reading the proper romances! This post was first published on 1/20/17; updated on 3/1/18. One day last fall, this book just showed up in my mailbox. Best day ever, right? I’m assuming it came from the publisher, but I’m not sure? So, thank you to the mystery sender! 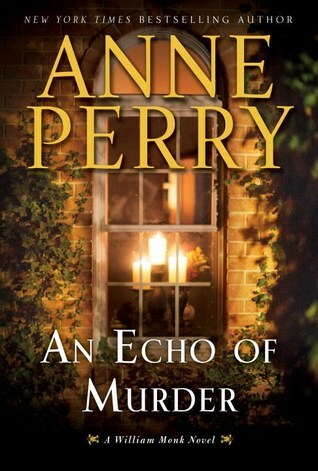 I hope you enjoy my book review of An Echo of Murder: A William Monk Novel by Anne Perry. And feel free to send me books any time you want to! “In this riveting new William Monk novel, Anne Perry delves into the diverse population of Victorian London, whose disparate communities force Monk to rethink his investigative techniques—lest he be caught in the crosshairs of violent bigotry. In the course of his tenure with the Thames River Police, Commander Monk has yet to see a more gruesome crime scene: a Hungarian warehouse owner lies in the middle of his blood-sodden office, pierced through the chest with a bayonet and eerily surrounded by seventeen candles. Suspecting the murder may be rooted in ethnic prejudice, Monk turns to London’s Hungarian community in search of clues but finds his inquiries stymied by its wary citizens and a language he doesn’t speak. Only with the help of a local pharmacist acting as translator can Monk hope to penetrate this tightly knit enclave, even as more of its members fall victim to identical brutal murders. But whoever the killer, or killers, may be—a secret society practicing ritual sacrifice, a madman on a spree, a British native targeting foreigners—they are well hidden among the city’s ever-growing populace. I haven’t read a murder mystery in a long time, so I enjoyed this fun change of pace. As a reader, I thoroughly enjoyed delving back into Victorian London and learning about the Hungarian population there. Monk and his wife Hester seem like they’re very good for each other. It would be difficult to be a detective, especially when a murder is so gruesome. Consequently, having a good support system around you would be a necessity. Along with the murder mystery comes the story of Crow and Will. Will is the adopted son of Monk and Hester, and he is one of my favorite characters. Will works as an apprentice for Crow, who is a doctor in a clinic. When they need a translator, Will finds Fitz, and he turns out to be quite helpful. I liked both Crow and Fitz as well. They work well together, and it’s fun to see Will learn and gain more responsibility. At first, all the different characters confused me, but it didn’t take long to figure it out. I liked the writing style and thought it flowed well, was easy to read and understand, and did a good job of grabbing hold of your attention. Ms. Perry developed the characters very well. Although each has a hint of mystery with an uncertain past, I thought that added to the story. The title, An Echo of Murder, fits the story well. It doesn’t smack you in the face, but it doesn’t take a long time to figure out either. I kept changing my mind about who I thought committed the murder, which is a sign of a good writer. There was a bit of a twist at the end, which made figuring it all out more difficult. I enjoyed this book a lot; it made me remember how much I enjoy reading mysteries.